Airtime via satellite - Where? Where can your program be heard when broadcasting via satellite? Where your radio broadcast can be heard depends on the satellite you are broadcasting from. 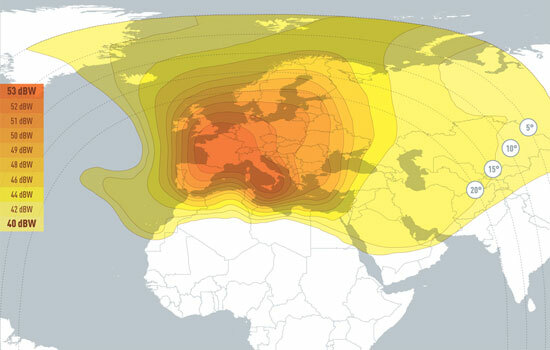 Each satellite has it's own coverage area. Each satellite is positioned at a geostationary location above the equator, the azimuth of this position determines which areas on earth each particular satellite can cover. Furthermore, the antennas of the satellite are designed in such way that they cover an intended coverage area with great precision. Alyx & Yeyi has platforms on the most important satellites, so that we can cover any destination on earth with a high quality signal. With a constellation of three high-power satellites, the HOT BIRD family at 13 degrees East forms one of the largest broadcasting systems in Europe, delivering 1100 television channels to more than 120 million TV homes in Europe, North Africa and the Middle East. The HOT BIRD video neighbourhood hosts 13 premium platforms, over 600 pay-TV channels, almost 500 free-to-air channels and over 100 HDTV channels. In addition to broadcasting television services, the system provides over 500 radio stations and multimedia services. The HOT BIRD neighbourhood is the prime position in Europe for reception of consumer television and radio. Direct-To-Home reception in beam centre is possible with antennae smaller than 70 cm, and with slightly larger antennas throughout Europe, North Africa and as far East as Moscow and Dubai. 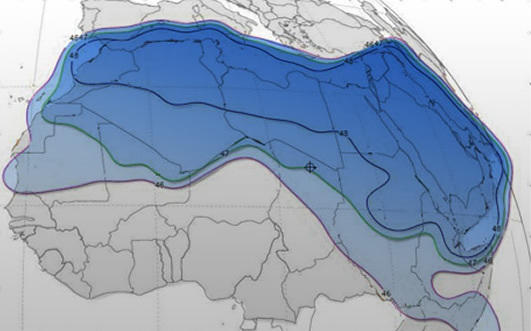 Arabsat owns and operates 6 satellites, at 4 orbital positions, 20°, 26°, 30.5° and 34.5° East: Arabsat-5C (20°E), BADR-4, BADR-5 and BADR-6 (26°E), Arabsat-5A (30.5°E) and Arabsat-2B (34.5°E). These state-of-the-art satellites, now the youngest regional fleet over the MENA area, make Arabsat the only satellite operator based in the region offering the full spectrum of broadcast and telecommunications services. They provide the highest downlink power and the widest coverage area than any other satellite fleet around, in addition to enabling an extraordinary complete access to European markets. The Egyptian Satellite Company, Nilesat, is a joint-stock company operating under the Free Zone Law in 6th of October City, and the name of a series of Egyptian communications satellites. It was established in 1996 to operate Egyptian satellites, associated ground control stations and uplinking facilities. It has launched 2 satellites to the 7° West orbital neighborhood (Nilesat 101 and Nilesat 102), and launched its second generation satellite, NILESAT 201 in August 2010. 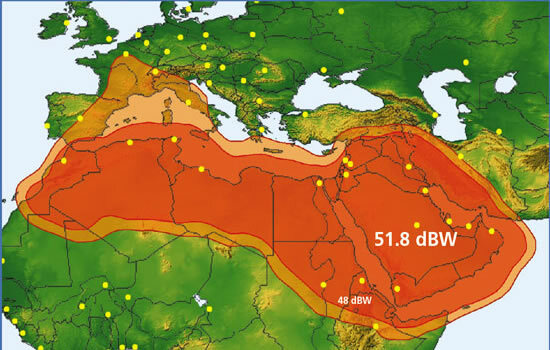 In December 2010, Nilesat broadcasts over 600 TV channels, and over 100 digital radio channels uplinked either from Cairo, Dubai, Amman, Doha, Riyadh and Beirut and covering North Africa, the Middle East and the Gulf Region. Nearly 76% of the TV channels are free to air, the remaining channels are encrypted. Nilesat viewership in the MENA region has shown steady growth, from 11 million households in 2003 to more than 40 million households in 2009. Nilesat is enjoying the highest viewership in the MENA region according to the most recent surveys in 2010, about 95 % of the house hold in the MENA region. The distribution of channels from the production studio to multiple regions around the world has increased dramatically during the past several decades, driven by programmers seeking new audiences from a population that routinely relocates to take advantage of economic and career opportunities. The U.S. is a key destination for these expatriates who also want to keep abreast of the latest news, entertainment and sports from their home countries via direct-to-home (DTH) delivery of their favorite television channels. Content originating from 66 countries around the globe. 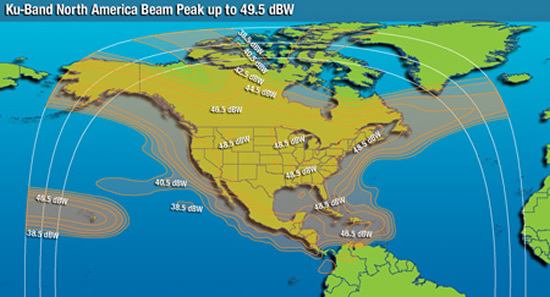 Channels are backhauled from around the globe via fiber and satellite to six entry points in the United States — either Intelsat teleports or partner facilities. From the teleports, the signals are uplinked to the Galaxy 19 satellite and then broadcast directly to viewers, who access the signals via individual antennas measuring 75 centimeters across. TV channels carried by Galaxy 19 cater to about 70% of the US population whose native language is not English or Spanish. About 85% of that content is free-to-air, making it extremely attractive to audiences. When households point their antennas to Galaxy 19, they can receive all of the free-to-air content, and also subscribe to the pay-content if they wish. 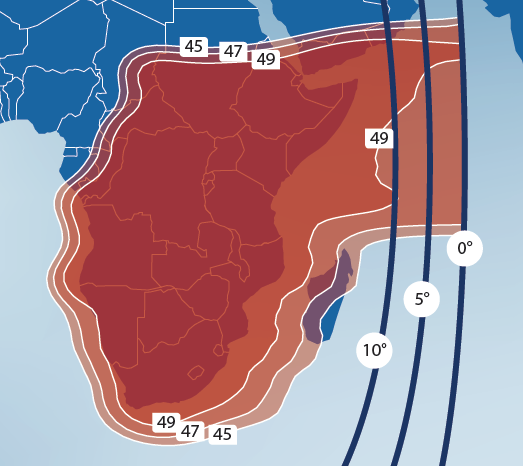 The SES-5 high-powered Ku-band payload will bring enhanced capacity to Africa, and it is ideal for supporting DTH services. NSS-6 brings high-powered Ku-band capacity that enables DTH services to Asia and is home to India’s first and largest DTH platform. Reaching markets from the Mediterranean Sea to Australia from a single orbital location, it also supports key telecom infrastructure and broadband networks across the Middle East and Asia. THAICOM-5 is a three-axis stabilized spacecraft with a payload capacity of 25 C-Band and 14 Ku-Band transponders. 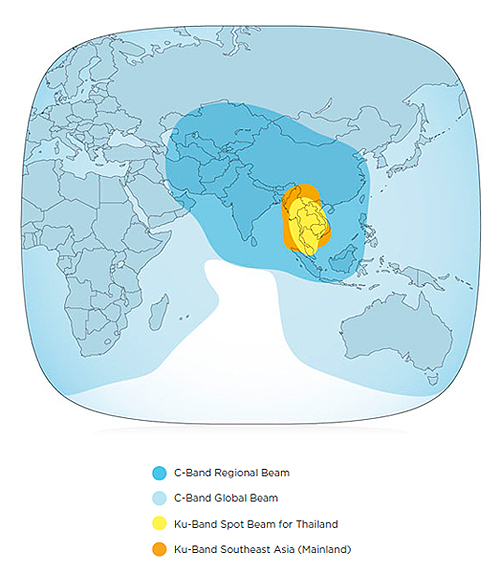 Global beam coverage on THAICOM-5 spans over four continents and can service users in Asia, Europe, Australia, and Africa. 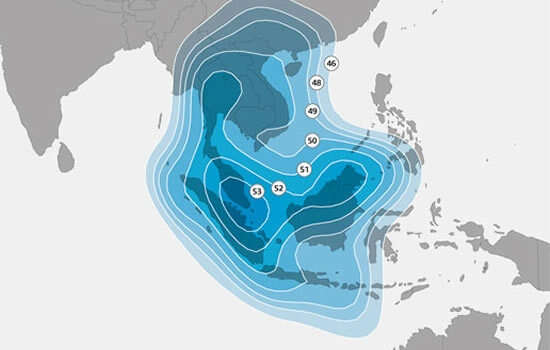 The high-powered Ku-Band transponders, with both spot and steerable beams, are ideally suited to Digital DTH services for Thailand and other countries in the region. THAICOM-6 will be co-located with THAICOM-5 at 78.5 degrees East (“Hot Bird” position), and carry a hybrid Ku- and C-band payload. The Ku-band payload will be comprised of 8 active transponders providing services to the Southeast Asia (mainland). 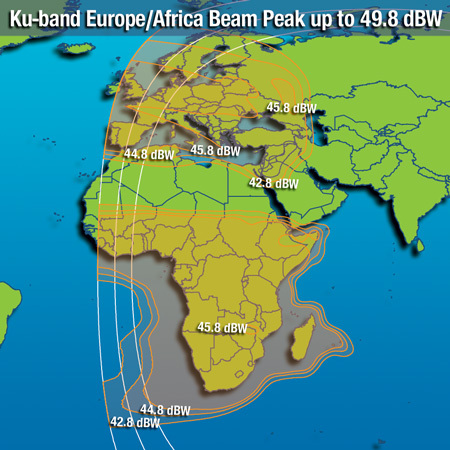 The C-band payload will feature 18 active C-band transponders providing services via the satellite’s regional beam to Southeast Asia and Africa, including Madagascar. 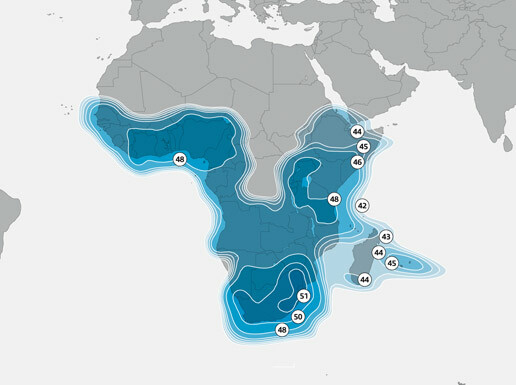 Intelsat is the number one satellite operator for DTH in Africa, featuring the largest number of viewers enjoying programming. Pay-TV giant MultiChoice offers an amazing channel selection on IS-20. Launched in 2011 to the 17°E orbital position — a new orbital slot over Africa — the AMOS-5 satellite positions Spacecom at the forefront of Africa’s emerging satellite services market. 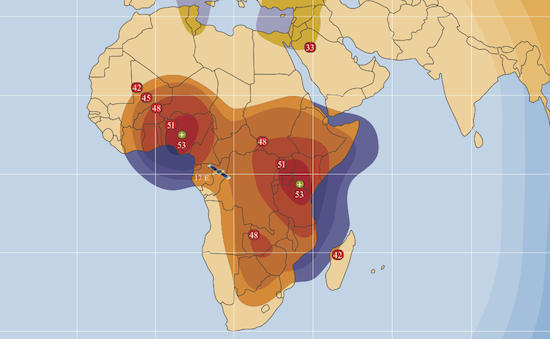 The AMOS-5 satellite features a fixed pan-African C-band beam and three steerable Ku-band beams — all covering Africa with connectivity to Europe and the Middle East and supporting multiple transponders in both C-band and Ku-band. The AMOS-5 satellite gives customers coverage over many of the world’s fastest growing and highest-demand satellite markets in the Middle East, Central and Eastern Europe, Central Asia and Africa. From its central orbital location of 15° West, Telstar 12 VANTAGE provides coverage of the Americas, Europe, Africa and the Middle East, as well as high traffic maritime zones in the Mediterranean, North Sea, Caribbean and the South Atlantic. It also combines traditional regional beams with high throughput spot beams allowing customers greater flexibility in the design of their networks along with full backward compatibility for their existing Ku-band terminal equipment.